Literally warmer to the touch than Western papers made of woodpulp, washi feels soft and creates a feeling of warmth in the viewer. Its tactile qualities make it wonderful. Since the fibers are left long and pounded and stretched rather than chopped, kozo papers have a deceptive strength. 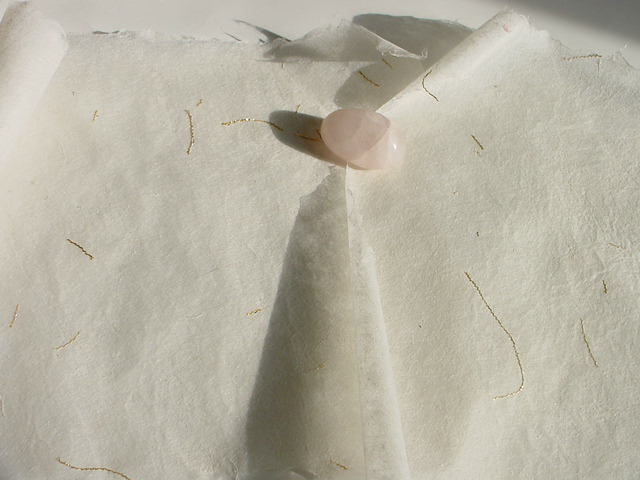 Pure-fibred papers can even be sewn and was used for armour and kimono-lining in earlier times. The length of the fibers and the nature of the raw materials ensure that kozo paper is highly workable when wet. Thus it is excellent for papier maché, and etching in which the paper must be soaked. These long fibers produce a luxurious deckle edge, the rough edge that marks a handmade paper. Kozo naturally translucent fibers, a quality specific to paper from the East. As such, it is used regularly for the transmission of light. The nature of the fibers creates a ready absorption of inks and dyes. Papers that are "pure fibred" and dyed will result in much denser and more vibrant color when fabric or watercolor dyes are applied. Since the fibers position themselves at random, it gives the paper a resistance to creasing, wrinkling and tearing - and means it can be used more like cloth, for covering books, or boxes etc. This paper weighs much less than other papers of equal thickness. As a paper for books, it can create texts of apparent weightlessness. Traditionally made Japanese papers are truly acid-free if they are unbleached and unsized. Examples of printed papers exist in perfect condition in Japan from 1000 years ago. Today, papers from the village of Kurotani are among the finest archival papers. "Things of excellence shall not die."